The threat, made in an early-morning tweet, comes as publicity grows about a caravan of thousands of people weaving its way up through Central America towards the U.S. border. 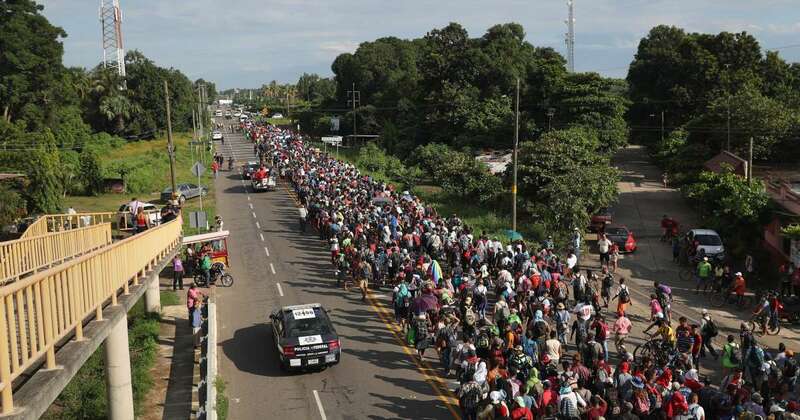 The caravan formed in the Honduran city of San Pedro Sula. Over the weekend, it crossed the border between Guatemala and Mexico, leading to growing alarm from anti-migrant voices in the U.S.
Guatemala received $249 million of U.S. aid in 2017, according to USAID. Honduras received $175 million, and El Salvador received $115 million. “Our programs contribute to a safer and more prosperous United States by helping to secure our borders, protect our citizens, and increase economic and business opportunities,” reads a pre-existing statement from Mark Green, the administrator of USAID, on the group’s website. “In addition, evidence suggests it helps mitigate the conditions that drive migrants to make the perilous trip north,” he said. Trump also claimed without evidence that “unknown Middle Easterners are mixed in” with the crowd of migrants. Trump did not say in his tweets whether cutting foreign aid to Mexico was being considered.